It makes sense that as owners of a vintage linen and lace shop, we are in love with fine linens. Tight woven linen, some white, some cream, some with hand printed flowers and vines, with vivid red, yellows and green colors in distinctive patterns. Colors just as alive and vibrant today as when they were first produced. You can visualize the artist passing the linen through each color separation, but not always registering the cloth exactly, as would happen if it were in today’s high-speed linen press. That’s what makes vintage so special; the imperfections given a warm hand, versus the cold steel of today’s production methods. Then you have the beautiful Damask linens, each with their subtle but distinctive pattern, that when laid out on a table, along with the matching napkins and fine silver, make dinner with friends a special event. 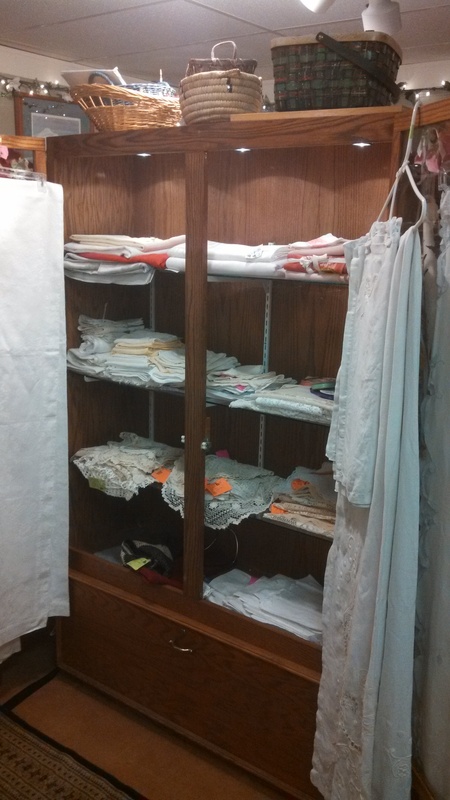 Oh, did I fail to mention we just picked up a trunk full of vintage linen this weekend? You probably would have guessed it anyway. I have spent my day, literally lying within the folds of history. I have smelled the clean air, the aroma of the slow cooked pot roast. In my mind, I have heard the clatter of dishes and dinnerware over the chatter of family all sitting down to Sunday dinner. I started thinking, what makes the experience of touching fine linen so special? For that matter, what makes the experience of collecting anything so special? Is it the love of handcrafted quality or the secret hoarders in me coming out. I don’t know the exact answer; it’s different for everyone, but I have my suspicions. The 30’s, 40’s, 50’s are my favorite years and it’s hard to pick any one thing that makes these generations stand out, until you voice all adjectives and realize that you have used “quality” more than once. The fact that the linens that we hold in our hand are so crisp and wonderfully colored after all these years and hundreds of washings later, are a big part of it. Modern day linens miss this level of quality. Maybe it’s the fact that these were produced when pride and quality of workmanship was in everything. Perhaps that’s what all of us look for when we purchase anything vintage. We are purchasing a chance to get back an era when times were simpler and families were closer and pride in workmanship was paramount. When you pick up a napkin from the 30’s you get the same feeling your grandmother felt and the same feeling your children will feel when they are the recipients of your collection. Secretly I want to keep every linen napkin I touch; every lace doily I wash, or every tablecloth I fold. I want my daughter to have this quality long after my passing. Then my husband says the magic words that bring me back to why we opened this store. He’ll say, “Do you know that when a customer buys these linens, that their children will probably end up using them in their future?” I pause and think about that and then it strikes me, that this is the guarantee that “quality” gives you. That’s what I live for. By retrieving, preserving and passing on this bit of cloth, I pass history forward. That makes me smile. We consolidated our stores into two locations B30 & B26. within the American Classics Marketplace @ 1815 N. Academy CS/CO. Stop in a pick a piece of this history. Take a look at what American workers did. Some of them (many of them) were your grandmothers and grandfathers, maybe – if you’re older, even your mother and fathers. They did good back then. Space B30. Check out the lace.